At some point during Saturday I decided to go on a training run of sorts somewhere in Central London. Also at some point on Saturday I decided to open up this initially individual sojourn to members of the London Brompton Club. I didn't really have anything in particular in mind and certainly had not even thought of a route - that would be far too taxing and it was a spur of the moment thing after all. I had a vague idea to ride in or around a park. My partner in crime iCrazyBee said that he would come, along with another two members of the club - Leo and Amanda. The meeting point was Piccadilly Circus at 09:00. I arrived just before the allotted hour and saw that iCrazyBee and Amanda were already there. Shortly after, Leo arrived. We waited for a few minutes just in case anyone else decided to turn up and after a polite time period we departed. This morning I rushed out of the house, put the bike in the car and drove to my parents house where I unfolded and headed off to Central London. After unfolding I discovered to my horror that in my haste I had forgotten my cycling helmet. I was going to have to ride a bicycle without one! I know that some of you reading this would not wear a cycling helmet if you were paid but I always have. I insist of wearing one even though I frequently run the risk of being inflicted with the dreaded 'helmet hair!' So, with great fortitude and strength of character I stoically carried on - without helmet. We headed towards Hyde Park. On route we spotted the new memorial to Bomber Command. The curse of a blogger meant that I had to stop and take some photos. Our bikes from left to right. My Raw Lacquer S2L. The legendary yellow M3L of iCrazyBee. Leo's elegant and slightly modified S6L and Amanda's green M3R. I decided to take the Raw Lacquer as it was such a lovely day but I always miss my beloved Orange Brompton. With the better weather finally hear, Boris Bikes were out in force. I know what I would rather ride! Hopefully the Olympics, Mr Wiggins winning the Tour and me competing and winning all three events at the Brompton World Championships will put cycling safety and riding back on the agenda. We passed Kensington Palace and were greeted by a long straight that begged to be ridden along at full pelt. There were quite a few muggles around (those without a Brompton), shakers and pedestrians and you really had to keep your wits about you. The long straight was excellent. I cycled full pelt and my iPhone told me that my top speed was 31 mph. This wasn't bad considering I only had two gears and had to weave in and out quite frequently. My heavier and more upright Orange M6L can go considerably faster and I think that it will be this bike that goes with me to the BWC over the S2L. There really were some rather strange sights to behold. There was a jogger with a small child in a pram running along with two small, rat-like dogs that for some reason I took an instant and sustained dislike to! An unusual water fountain caught our attention and we attempted to have a drink. This was easier said than done but we were all grateful for some cool water. At about 10:00 Amanda said her goodbyes and down to three we made another few circuits. At about 10:30ish I said my goodbyes and headed home. I think that the next time I do a morning training run I will have to go a great deal earlier. It was starting to get busy by 09:30 and it would be much better having things emptier and less crowded. Alternatively I might go for a night ride. I am glad that I put the invite out there. 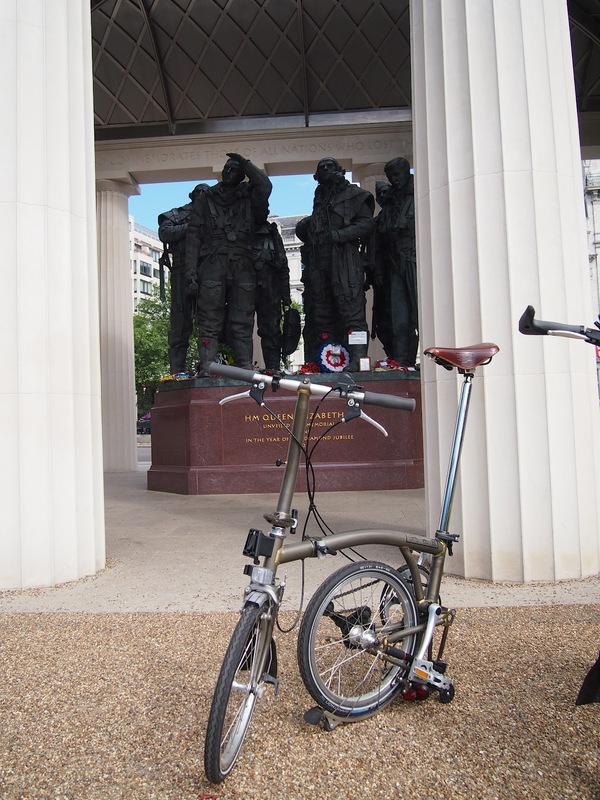 It is always great to meet fellow Bromptonians and it was good to see iCrazyBee again. My training for the BWC had a good start today and I hope that I can keep it up. For my next training run I am toying with the idea of cycling the 7 mile circuit of Richmond Park. This would take about 30 minutes at a fairly average 15 mph so I would like to do this a few times. Watch this space. I was in London last summer, and I saw the Boris bikes, but didn't get the chance to use one. 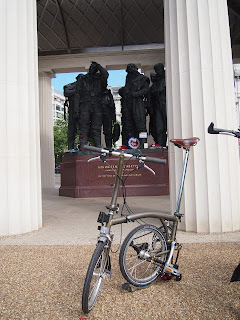 I have a folding bike, (a Montague, not a Brompton), and I try to travel with whenever I can. I much prefer it to bike shares or rental bikes.